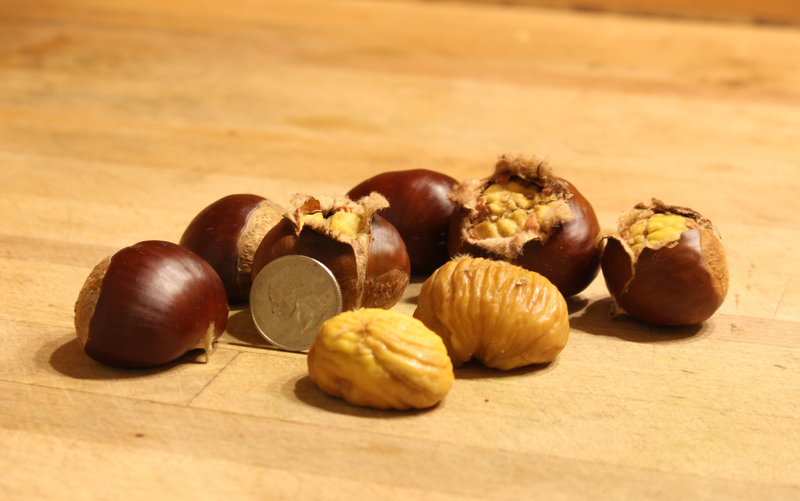 American chestnuts, Castanea dentata, are small but very tasty, or so I have read and heard. I’ve never tasted one. The trees were devastated by a blight throughout the early 20th century. Previous to blight, the trees were so numerous in our eastern forests that it was said that a squirrel leaping from one chestnut branch to another could travel from Maine to Georgia without touching the ground. Something like 40 billion trees died to the ground. But roots survive, sprouting new shoots each year to provide a host to keep the blight fungus alive. Trees might even grow to have trunks a half-foot or more in diameter before the fungus strikes to cut the tree to the ground again. Various chestnut species inhabit different parts of the world. Most blight resistant are Chinese chestnut (C. mollisima) and Japanese chestnut (C. crenata), where the blight originated. European chestnuts (C. sativa) is susceptible to blight, so has been mated with the Chinese or Japanese species to yield resistant, tasty hybrids. My Colossal and Marigoule trees are hybrids of the European and Japanese species. Marigoule is quite resistant to blight. 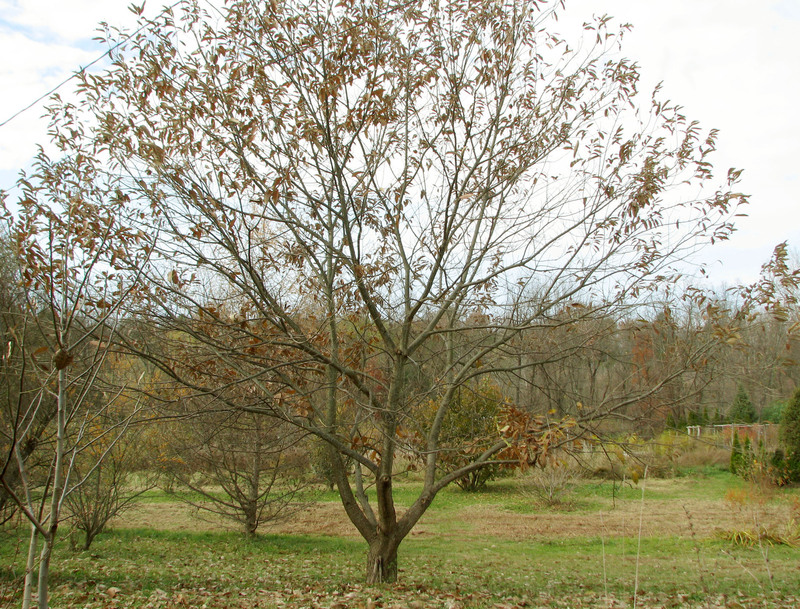 The tree also has an elegant, upright form, more like that of American chestnuts. So what’s the problem? If blight were to eventually strike Colossal dead, I could just walk a little further and gather Marigould nuts from the ground. Except that any chestnut tree needs cross-pollination from another variety in order to bear nuts. When I planted Colossal and Marigoule, I also planted some other chestnut trees, blight resistant Chinese chestnuts: a seedling and the varieties Peach and Eaton, the latter of which also has Japanese and American chestnuts in its parentage. All these yield good-tasting nuts, though not nearly as large and easy to peel as Colossal and Marigould, all are blight resistant, and any of them could pollinate Marigoule. Problem solved? Not quite. The plot thickens further. The nuts of Colossal, Marigoule, and other Japanese and Japanese hybrid chestnuts sometimes get a black staining that ruins their quality. Not all the nuts, just some of them. Recent research pins the blame not on yet another disease, but on pollen from Chinese or Chinese hybrid chestnut trees. Going forward, I’m keeping a close eye on Colossal. If Colossal gets sick, one option that, so far, has been effective only in Michigan, might be to infect the blighted trees with a blight fungus that has been weakened because of infection with a virus. The weakened fungus is less deadly. Or, I could cut down Colossal and Marigoule, and feast only on the Chinese chestnuts and their hybrids. But Colossal and Marigoule are both so productive and produce such large, tasty, easy to peel nuts. I could cut down the Chinese seedlings and hybrids to prevent their pollination and staining of Colossal and Marigoule nuts. Except I’ve recently discovered that my Marigoule must have been pollinated by one of my Chinese trees because Colossal is pollen sterile. Marigoule can pollinate Colossal, but not vice versa. So to get nuts on Marigoule without Chinese chestnut pollen, I’d need another Japanese chestnut or hybrid, either a whole new tree or a branch grafted on either Colossal or Marigoule.. The variety Labor Day (also known as J60) yields good nuts and is blight resistant. I’ll probably take the “wait and see” option. After all, there’s no sign of blight on any trees; few nuts get staining; and we gather more than enough nuts for roasting and stews. This entry was posted in Fruit, Gardening, Planning and tagged Castanea, chestnut, Colossal, crenata, Marigoule, mollisima, sativa. Bookmark the permalink. Trackbacks are closed, but you can post a comment. One further thought – if you are still considering planting another variety to pollinate the Marigoule tree, I would recommend the Precoce Migoule cultivar. It has done very well for me here in Michigan and considerably exceeded in growth the Labor Day ones I planted. Thanks, I might try Precoce Migoule.